Many of those who own a pair of the Adidas Forest Grove liked the distinctive design of the sneaker. Many also claimed that the sneaker is very comfortable to wear. A handful of buyers think that the shoe is an excellent addition to the Adidas collection. The shoes are of quality make; a few people pointed out. One reviewer like how the color scheme and the material that is used complement one another. Another reviewer loved how the shoe could fulfill both the casual need and the sports need aspect. With the sneaker looking like Adidas’ old shoes, many buyers like how it reminds them of their younger days. A bunch of reviewers commented that they liked the colors that the Adidas Forest Grove is available in. People love how it is an old school shoe with all the comforts of a modern sneaker. Based on multiple reviews, the sneaker is very lightweight. Everyone who got the shoe agrees that buying it is getting value out of their money. One reviewer was quick to point out that the stitching of the materials above the toe area was lacking in quality. 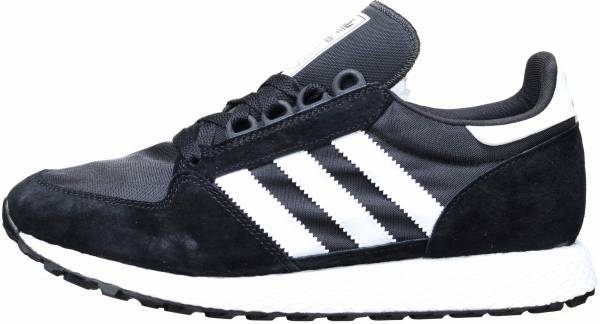 Some reviewers were dismayed with the name change of the sneaker as it looks exactly like a classic Adidas runner from the 80s. The Adidas Forest Grove has a distinctive look different from everything else on the market, but it has much of the modern comfort that people look for in a sneaker. It is comfy and cushy yet still delivers well performance-wise. It’s also pretty easy to style with given the good number of colorway options available for both men and women. Some, though, have voiced their dismay about the name change of the sneaker as it looks exactly like the 1980s Adidas Oregon. A powerhouse brand when it comes to sporting apparel, accessories, and footwear, Adidas is at the forefront of releasing quality products to a good number of fans from all over the world. Founded by Adi Dassler back in 1920, Adidas didn’t get its name up until the 1940s when Adi’s brother left the company and Adi had to make a name change. He settled on Adidas and never looked back since then. By the 1970s, Adidas had entirely become an athletic shoe brand that was already topping sales in the USA. When 1972 came in, Adidas officially became the supplier for the 1972 Munich Olympic Games. In 1982, Adidas released the Adidas Oregon, a running shoe that garnered attention because of its excellent performance ability and its stylish look. Everyone loved the shoe but what people didn’t know was that come the new millennium, Adidas would ultimately revive this shoe soon. In 2018, Adidas introduced the Adidas Forest Grove, a sneaker that takes inspiration from a number of Adidas sneakers, restoring a classic but adding in modern touches to keep it up to date. It has the retro stylings of past shoes with a modern level of comfort imbued into it. The sneaker has a breathable mesh and suede upper construction that is capped off with the signature 3 -stripe detailing Adidas is known for. Meanwhile, a webbed midsole can also be seen on the Adidas Forest Grove. When it comes to styling the Adidas Forest Grove, sneakerheads will be pleased to find out that mixing and matching with it is just as easy and fun. Coming in great colorway options, the Crystal White or Core Black options that the Adidas Forest Grove is available in captures perfectly the versatile retro style of the sneaker. Being a running-inspired shoe, the Adidas Forest Grove naturally looks good with sports attires such as joggers and sweatshirts, gym shorts, and even jogging pants. The sporty look is great for that everyday casual wear that can be worn on a quick errand run. For something more appropriate but still chill enough, going with jeans, khaki pants, and even coveralls will do no wrong. Shorts are also an option for those days when an adventure is on the agenda. The Adidas Forest Grove boasts a mesh and suede upper that is perfectly breathable when worn. This lends a hand in keeping things fresh and comfy. It's not constricting on the feet when worn and at the same time, looks great. The lace-up closure system, on the other hand, gives the wearer the freedom to customize the fit of the Adidas Forest Grove. Coming in sizes that are available for men and women, the Adidas Forest Grove is available from US size 5 to 14 for men, and US size 5 to 11 for women. Everyone loves a good dose of nostalgia without it taking too much of the old school to heart. With the Adidas Forest Grove taking inspiration from the old school Adidas kick, the Adidas Oregon, the sneaker has just enough of what people are looking for in shoes: comfort, great design, and the nostalgic vibe that everyone seems to be getting hooked on nowadays. The sneaker has a lace-up closure system to it. Its upper is made from suede and a nylon mesh. It also holds a rubber outsole.